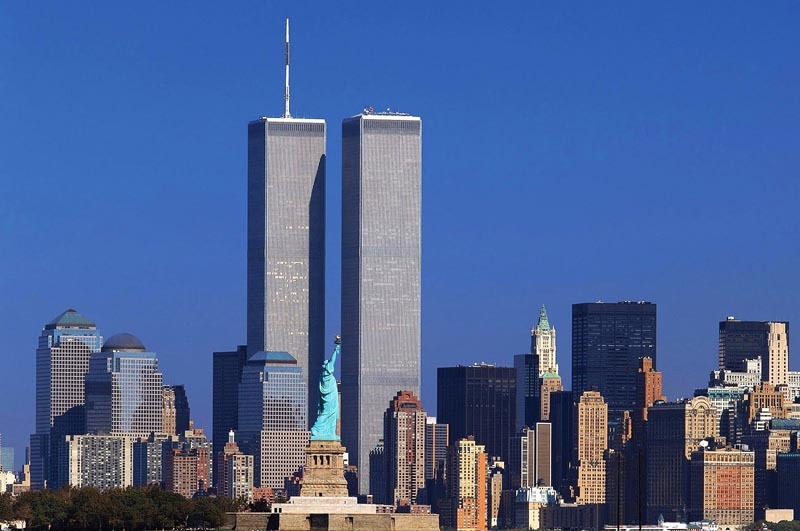 The September 11 attacks were a series of coordinated terrorist attacks by the Islamic terrorist group al-Qaeda on the United States on the morning of Tuesday, September 11, 2001. 23 New York City Police Officers and 37 Port Authority Police Officers. 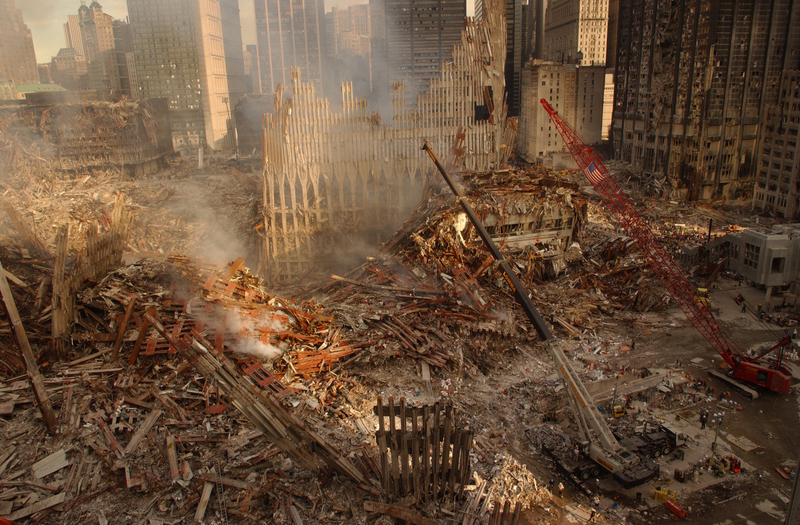 Only six people in the World Trade Center towers at the time of their collapse survived. Almost 10,000 others were treated for injuries, many severe, and caused $10 Billion Damage. The death toll among those sickened by the toxic dust and ash of Ground Zero will within as little as five years exceed the number of people killed on the day of the 9/11 attacks, experts say. At least 1,000 people, and probably many more, have died often lingering, painful deaths resulting from illnesses related to their exposure to debris that spread from the wreckage of the World Trade Center towers in downtown Manhattan. More than 37,000 are officially recognised as sick. There are a lot of people who are very, very ill with lung disease who will see at least 10 years taken from their normal life span, and we are already seeing many more premature deaths occurring, and among younger people, from the cancers. 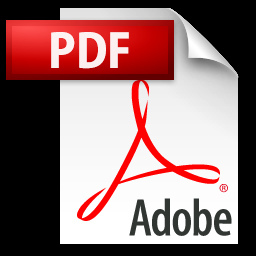 The passenger airliners operated by two major U.S. passenger air carriers (United Airlines and American Airlines), both departed from airports in the northeastern United States bound for California, were hijacked by al-Qaeda terrorists. The FIRST hijacked plane, American Airlines, Flight 11, a 767 bound from Boston to Los Angeles with 81 passengers plus crew, crashed into the NORTH Tower, at 8:45 a.m., hitting around the 78th floor and leaving a gaping black hole. The SECOND hijacked plane, United Airlines Flight 175, another 767 bound from Boston to Los Angeles, slammed into the northeast corner of TOWER 2, the SOUTH Tower, 18 minutes later, exploding in an orange fireball. 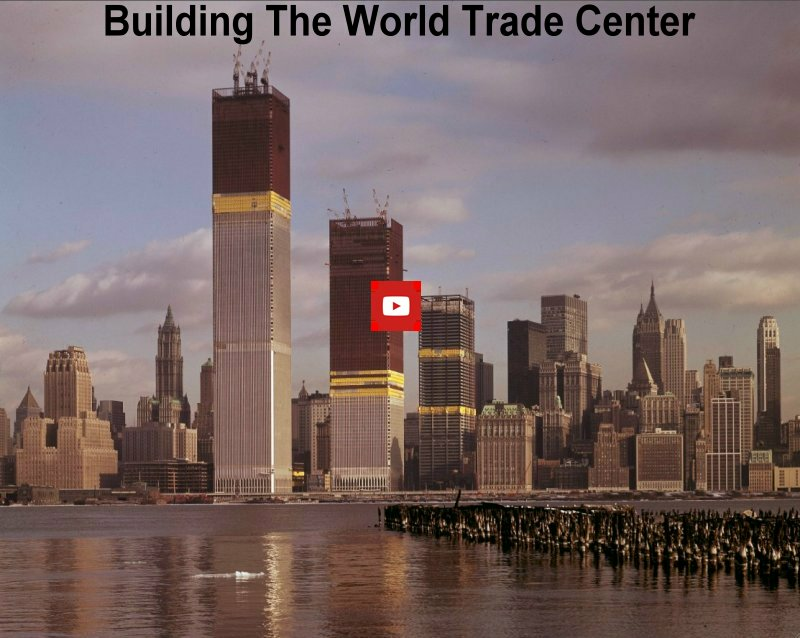 the 47-story "7 World Trade Center Tower", as well as significant damage to ten other large surrounding structures. 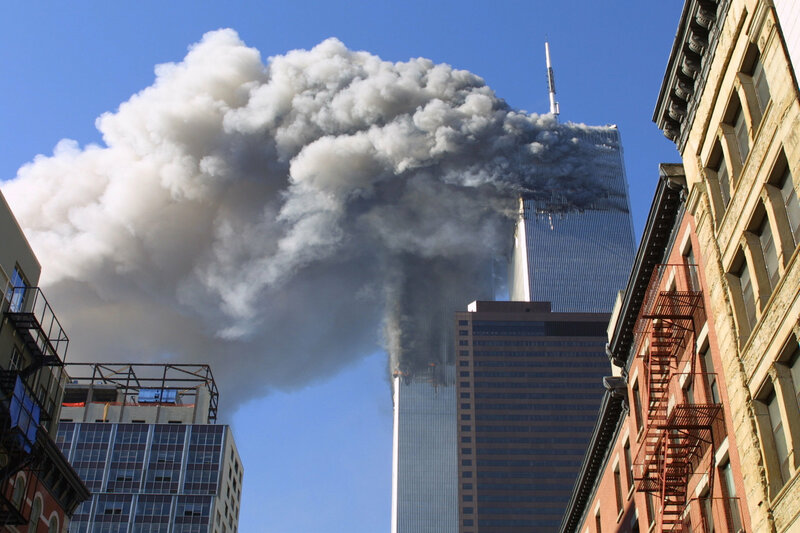 The structural steel of the skyscrapers, built to withstand winds in excess of 200 miles per hour and a large conventional fire, could not withstand the tremendous heat generated by the burning jet fuel. The attackers were Islamic terrorists from Saudi Arabia and several other Arab nations. Reportedly financed by Saudi fugitive Osama bin Ladens al-Qaeda terrorist organization, they were allegedly acting in retaliation for Americas support of Israel, its involvement in the Persian Gulf War and its continued military presence in the Middle East. Some of the terrorists had lived in the United States for more than a year and had taken flying lessons at American commercial flight schools. Others had slipped into the country in the months before September 11 and acted as the muscle in the operation. The 19 terrorists easily smuggled box-cutters and knives through security at three East Coast airports and boarded four flights bound for California, chosen because the planes were loaded with fuel for the long transcontinental journey. Soon after takeoff, the terrorists commandeered the four planes and took the controls, transforming ordinary commuter jets into guided missiles. Their targets were The World Trade Center Towers, The Pentagon and The White House. Suspicion quickly fell on al-Qaeda. The United States responded by launching the War on Terror and invading Afghanistan to depose the Taliban, which had harbored al-Qaeda. 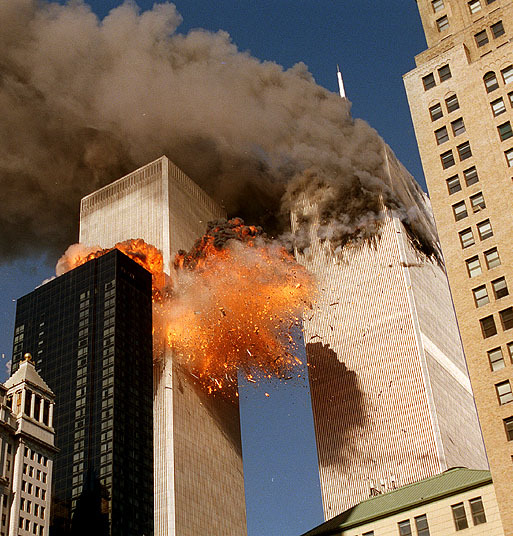 Osama bin Laden claimed responsibility for the attacks. Al-Qaeda and bin Laden cited U.S. support of Israel, the presence of U.S. troops in Saudi Arabia, and sanctions against Iraq as motives. and killed by SEAL Team Six of the U.S. Navy in May 2011. The destruction of the World Trade Center and nearby infrastructure caused serious damage to the economy of Lower Manhattan and had a significant effect on global markets, resulting in the closing of Wall Street until September 17. 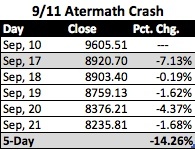 The Dow-Jones Index sat at 9605 prior to the attack, but suffered a massive decline over the week after being closed for 5 days.The Index now stands at 8235 at 21/9/2001. The Dow Jones industrial average started the new week at 8,235.81 after falling 1,370 points. The biggest point drop ever and its fifth-biggest percentage decline in 61 years.